A Facebook post resulted in the arrest of two young girls in Palghar, Maharashtra. 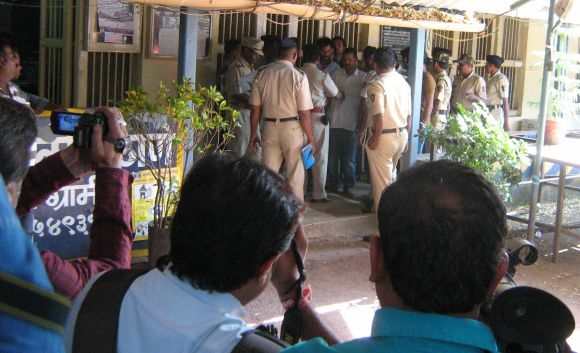 Rediff.com's A Ganesh Nadar met them and others present in Palghar to find out what actually happened. A remark on Facebook questioning the shutdown in Mumbai and Maharashtra for Shiv Sena patriarch Bal Thackeray's funeral led to the arrests of Shaheen Dhada and her friend Reenu Srinivasan. While Shaheen and Reenu were released on bail, ten men were arrested and sent to judicial custody for ransacking Shaheen's uncle's clinic. This was a case where the virtual world met the real world, and the real world reacted violently. Palghar is a town panchayat 87 kilometres from Mumbai on the Virar-Dahanu stretch to the north of Mumbai. The area outside Palghar station is as crowded as any other suburban railway station in Mumbai. The autorickshaw drivers are rude -- like many in Mumbai -- and after asking several of them, one finally agrees to take me to the Dhada hospital. On our way we see a huge freshly garlanded portrait of Balasaheb Thackeray in the middle of the road. Outside the hospital are three OB news television vans, with curious onlookers crowding around to see what is happening. Inside, the receptionist directs journalists to the consulting room. There are no patients around and women working in the hospital are seen giggling in a corner, perhaps enjoying the attention the hospital has been getting in recent days. Farook Dhada, Shaheen's father, is noncommittal when he is asked what he plans to do next. "What can I plan? The police have called us again; I am going to the police station," he says. In the consulting room, journalists crowd around Shaheen's uncle, Dr Abdul Gaffar Dhada, whose orthopaedic hospital was ransacked. He has both Shaheen and Reenu sitting next to him covered in veils with just their eyes visible. Shaheen and Reenu answer questions softly and carefully, giving politically correct statements. Shaheen says her comment on Facebook was offhand and she now regrets it. The girls add that lady constables were present when they were arrested and held at the Palghar police station. Makarand Patil is a ward councilor in Palghar. The 27-year-old with an MBA in human resources gave up his government job to become a politician. He is a member of the Bahujan Vikas Agadi, a political party that dominates the area. "We had just come back from the (Thackeray)funeral when we heard that some girl had insulted Balasaheb. We inquired and found out that it was this girl. All that the public demanded was that the statement be withdrawn," says Patil. "There is nothing wrong in demanding an apology. People had not even gone back home when this happened. Emotions were running high and the girl should not have written something like this," he feels. Rajesh, a local resident, shows us Shaheen's Facebook comment on his iPhone. "This girl may have many friends, but at least one-third of her friends must be from Palghar. The Dhadas are big shots here. They are well-known," he says. "What she wrote was shared and forwarded. Around six boys went to Shaheen's house and told her to take off the comment. She refused, saying there was no harm in what she had written," Rajesh adds. "One of the boys informed the Shiv Sena shakha pramukh, who lodged a formal complaint with the police. As he doesn't understand the Internet, the shakha pramukh took a lawyer along with him to the police," says Rajesh. A journalist at a local Marathi weekly newspaper had a different take on what occurred. "I was there when it happened. 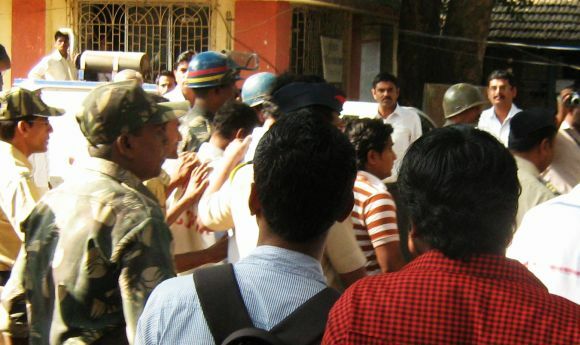 A mob gathered outside the hospital and later ransacked it. The girls are lucky the police arrested them. The mob was all charged up. They had just returned from the funeral and would have assaulted the girls if the cops had not taken them away," said the journalist, speaking on condition that he would not be identified by name for this report. People who witnessed the incident say the police were outnumbered. "They did the right thing by arresting the girls," says Rajesh Patil, a farmer. "The girls were wrong, so what is wrong in arresting them?" he asks. "Let the court decide their punishment or release them. The same rule applies for the boys who attacked the hospital," Patil adds. A member of the Dhada family insists that Shaheen was targeted because she is a Muslim. "The same people would have ignored the comment if she was from another community," the family member believes. The tahsildar's office and the police station are located in the same compound in Palghar. A large crowd watches the action from outside, debating who is right. "I want peace in Palghar -- that is my only desire," announces the mayor of Palghar. None of the accused look like they have used the Internet or have Facebook accounts. And none looks like they could be friends with Shaheen Dhadha on Facebook to read her posts. First Class Magistrate R G Bagade remands the ten men to 14 days in judicial custody. They are free to apply for bail individually. Rajesh Patil is upset with the order. "What do you mean judicial custody? Why can't they be allowed bail? It's not a serious crime they have committed," he says. Local journalists allege that most of the arrested men belong to the Shiv Sena, a point denied by local Sainiks. "They are members of the public. Are you saying only Sainiks attended the (Balasaheb Thackeray's) funeral?" "If they are not Shiv Sainiks, why are all the local Sena leaders here?" asks a journalist. "Even if they are not Sainiks, the Sena leaders have to come, as they have done this in support of their leader Balasaheb," Rajesh explains. The arrested men will probably be out on bail soon. They will likely become heroes. Their families will ask Shaheen and Reenu to be more careful with their comments on the Internet. The NewsCycle will ensure the case fades from the headlines soon. In India, life goes on.